Ricky Ball left home on October 16, 2015 to grab something to eat for his girlfriend and himself not knowing he would never make it home again. Ricky also wanted to go to one of his former high school's games that Friday night with his cousins, but his cousins already had a carload planning to go to the game that night. Certainly Ricky and his cousins were not too bothered by this because they were sure there would be another opportunity to go to another game together the following week. 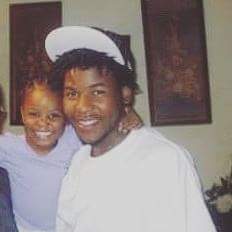 Ricky also had a morning ritual to pickup his daughter Makayla, affectionately called "Bug" which he and his daughter were used to on a daily basis; but the next morning after Ricky was killed in a police involved shooting, Bug's mornings would never be the same. Ricky, his daughter Bug and his cousins did not know October 16th would be their last opportunity to see their loved one. They WERE NOT expecting Ricky Ball to be killed on the night of October 16, 2015 by rogue members of the Columbus, Mississippi Police Department's special operations group (SOG). The senseless unlawful killing of Ricky Ball ensured that he, his daughter and his family would never see each other again. The main officers involved are Canyon Boykin, Yolanda Young and Johnny Branch. According to multiple complaints, the SOG was known for harassment, aggressiveness and unlawful tactics used to exploit and violate the rights of citizens in the areas they frequently kept under surveillance. That fatal night of Ricky Ball's death, the SOG was not on patrol duty but were instead lurking on the north side of Columbus when they were contacted by a former CPD drug officer Joseph Strevel to stop the car in which Ricky was a passenger. The SOG officers knew exactly who Ricky Ball was when they stopped the vehicle and when Canyon Boykin shot and killed Ricky as he attempted to get away. Yet, the SOG member Canyon Boykin immediately recorded that shots were fired at an unknown person. Ricky Ball was killed for simply running AWAY from SOG member Canyon Boykin and laughing at Boykin during previous unsuccessful chases. The week before Ricky Ball was killed Ricky told one of his first cousins that Canyon Boykin pointed Ricky out to another officer in front of a group of witnesses saying, "that m-f right there thinks he's above the law, but I'm gonna get him". The next week Canyon Boykin "got him" indeed. (A) According to news reports, a CPD narcotics agent, Joseph Strevel, told Canyon Boykin and his SOG gang to stop the car that Ricky Ball was a passenger in because Ricky was targeted by Strevel based on an informant's tip to Strevel. (B) This fact shows that Boykin and the SOG knew exactly who Ricky was BEFORE the stop was made. Since there was an established history between Boykin and Ricky from the two previous times Boykin engaged Ricky, Boykin already knew Ricky was going to run. We believe Boykin and the SOG were determined not to let Ricky get away from them a third time and this is the primary reason why they DECIDED not to turn on their body cameras. This information about the call from Strevel to the SOG also brings to light that even though the Official CPD Press Release by former Chief Tony Carleton states otherwise, a faulty tag-light was NOT the true reason Boykin and the SOG stopped the car in which Ricky was a passenger. (C) When Canyon Boykin and his SOG gang pulled over the car driven by Shannon Brewer that Ricky was a passenger in, Ricky jumped out and was running AWAY before Boykin and his gang could even get out of their unmarked car. (D) Boykin jumped out of his car and fired at least two shots at Ricky WITHOUT ANY interaction between him and Ricky whatsoever. By the time Boykin began shooting, Ricky was yards away from him. By this time, Ricky was too far away from Boykin to be tased and too far away to be physically engaged in a scuffle. This distance between Boykin and Ricky will prove that it was impossible for Ricky to have been knocked down by a shot from Boykin's taser, then get up and scuffle with officers within the 10 seconds reported by authorities. Also, the fact is in court documents that Canyon Boykin's Taser was not fired until 10:49 PM that night. The traffic stop was called in around 10:08 PM, 41 minutes before Boykin's Taser was fired. So we can see clearly that Boykin is lying in his civil lawsuit about what happened that night. (E) While chasing Ricky, we believe Boykin may have fallen into a ditch that Ricky jumped over, and rose up in the ditch shooting several more shots at Ricky. People saw an officer near the ditch shooting that night. Ricky is running away from Boykin this whole time and at some point Ricky is hit from behind by some of Boykin's bullets. (F) As Ricky is running through his neighborhood screaming "y'all help me, they gonna kill me," neighbors began coming outside their homes to see what all the shooting and yelling was about. One of Boykin's bullets shattered one neighbor's screen door window and lodged into her metal back door. Ricky eventually tried to hide, but Boykin and his gang found Ricky. Community members went to the area where the ambulance picked up Ricky and noticed how the leaves were disturbed as if someone was dragged at least 50ft. (G) According to multiple community members who attended a people-packed city council meeting, officers on the scene were intimidating the people watching this incident by pointing guns at the witnesses and trying to make all witnesses leave the area completely. Community members at the Community meeting at Hunt High museum were saying Officers from the Columbus Police Department and the Lowndes County Sheriff's Office were seen huddled around Ricky's body with one Officer reaching towards Ricky's body and anything that was done to Ricky was done after Ricky was found and dragged. Canyon Boykin's Taser trigger log supports this view as well. 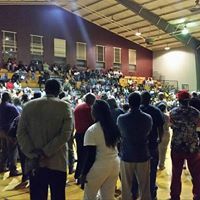 Community members at the community meeting at Hunt High also said they saw the gun being dropped beside Ricky Ball while Ricky was laying there bleeding to death. (H) The paramedics involved took entirely too long to move from their staging area, up the street from where Ricky was laying, to the actual place where Ricky laid bleeding to death. We believe the paramedics were purposefully held up by the officers on the scene to allow Ricky to bleed to death in a conspiracy to end Ricky's life. Police officers were seen entering and exiting the ambulance repeatedly before the paramedics headed to the hospital with Ricky's body. The paramedics did not leave the scene to take Ricky to the hospital with any sirens on or with any interior lights on or any police escorts. Even though multiple witnesses on the scene said they believe Ricky Ball was still alive when EMTs arrived at the staging area, Ricky was loaded into the back of the ambulance with no oxygen mask on his face nor were there any other life-saving efforts being performed on Ricky. There was a clear lack of urgency in transporting Ricky Ball to the hospital for treatment, a penetrating trauma victim with multiple gun shot wounds!... The paramedics simply eased off the shooting scene in no hurry at all as if they were carrying a dead body according to witnesses. In initial news articles former chief Tony Carleton stated that Boykin who is "believed to be the shooter" said that Ricky pointed a gun at Boykin. This is the only allegation that Boykin could have used in order for him not to be arrested that night for murder. Although this gun-pointing allegation has been repeated in news reports, former police chief Tony Carleton did not make this allegation part of his official CPD press release published almost two weeks after Ricky Ball was killed. The fact that Boykin's partner, Johnny Branch, did not attempt to shoot Ricky Ball nor did Branch do anything else that suggests he thought Boykin's life was in danger shows any reasonable person that Ricky Ball did NOT point a gun at Boykin and there is no Real Evidence of Boykin's life ever being in danger from Ricky Ball. Officers claim that a gun was somehow "found" near where Ricky collapsed...as if a dying man is going to run through a neighborhood with a gun in his hand while being shot repeatedly and screaming for help... Community members at the Hunt High community meeting said an officer was seen dropping a gun on the crime scene as others officers were huddled around Ricky's body. Ironically, this same gun belongs to, Garrett Mittan, one of the first officers on the scene the night Ricky Ball was killed. This same officer allegedly reported this gun stolen during one of two alleged burglaries of his home. However, the burglaries were not reported by the CPD until 12 days AFTER Ricky Ball was murdered, according to CPD police reports. Forensics are being performed on this gun to determine if this gun is even connected to Ricky Ball. In the beginning of the investigation into Ricky's killing, the Chief of Police, Tony Carleton, resigned and the Assistant Chief, Tony McCoy, decided to retire. Carleton took a pay cut, was hired and transitioned from Tupelo, MS police department as chief to Columbus Police department becoming chief in June 2014 and at some point brought in Assistant Chief McCoy from Tupelo also. Less than 18 months after Carleton became chief of police in Columbus, both he and his assistant chief decided to quit. Canyon Boykin attempted to resign but his resignation was rejected by the the city council. The Columbus City Council decided to fire Canyon Boykin instead. Joseph Strevel, the CPD drug officer who told Boykin to stop the car in which Ricky Ball was a passenger, has also resigned from the Columbus Police Department. 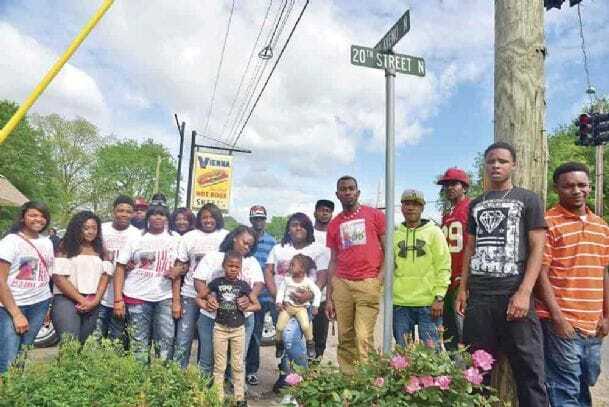 Strevel is now reportedly working for the local Sheriff's Department in Lowndes County, MS. Yolanda Young, the supervisor of this SOG group, has also left the department. Former CPD Public Information Officer Raymond Hackler was the first person to put out the false narrative about a struggle between Ricky and Boykin in an article in The Clarion-Ledger. According to City Officials, neither Canyon Boykin, Johnny Branch nor Yolanda Young made an incident report about that deadly night (in total violation of the department's SOP on deadly force protocols) so how could Hackler have truly known if there was really a struggle or not? Hackler has also quit the police department. Garrett Mittan has also left the CPD and was hired by the City of Starkville, MS as a police officer about 20 miles away. 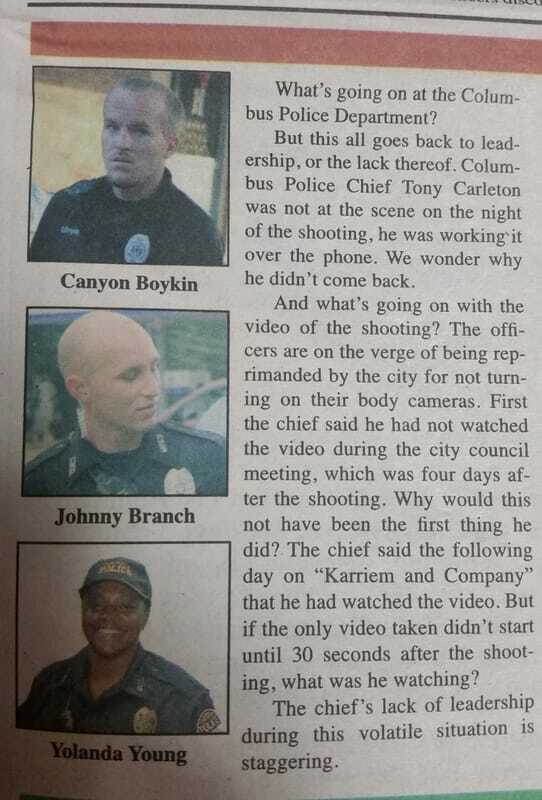 Canyon ​Boykin, Yolanda Young and Johnny Branch were all equipped with body cameras and audio recorders. None of their body cameras or audio recorders were activated prior to or during the shooting incident that resulted in the death of Ricky Ball. Yolanda Young had not turned on her body camera and audio recorder during the entire day that Ricky Ball was killed because she was not even wearing her video and audio recorder. Furthermore, Yolanda Young, the group's Supervisor, had not turned on her body camera nor her audio recorder for several days prior to the day Ricky Ball was killed. However, CPD reported that 30 seconds after the "shooting", Canyon Boykin decided to activate his body camera and audio recorder. What part of the "shooting" is the CPD referring to since at least 9 of Boykin's shell casings were recovered by the MBI? The question is...after which one of Boykin's 9 shots did he activate his camera and recorder and how did CPD get a time-stamp about the "shooting" when no body cameras or audio recorders were being used? The community was made aware by a Standards of Procedure (SOP) expert that body cameras and audio recorders are supposed to be activated before an officer turns on his blue lights so that the officer will have time to think about what he is about to do. Concerns about some police officers abusing the use of deadly force and police brutality, in general, are the main reasons communities nationwide have insisted their officers wear and use body cameras and audio recorders. So, why would neither Boykin, Young nor Branch turn on their body cameras and audio recorders on this fatal night when Ricky was killed? Even though they had been using their body cameras and audio recorders throughout their entire shift that day, every member of the SOG chose not to use their body cameras nor audio records when they were told to stop the car that Ricky Ball was riding in as a passenger. Columbus Mayor Robert Smith says Canyon Boykin was fired because he did not turn his body camera or recorder on prior to the shooting and killing of Ricky Ball. Boykin also violated the city's social media policy after the shooting and killing of Ricky Ball by using racial slurs and other derogatory comments online. Additionally, Boykin's girlfriend at the time, Alisha Stanford, was riding in the police car with the SOG members without permission. In addition to all of these violations, Boykin had already been suspended previously for body camera and audio recorder violations before Ricky Ball was killed. Boykin's reckless attitude also caused the City to have to settle a racial profiling suit out of court with a Columbus resident before he murdered Ricky Ball. Branch and Young were suspended for 30 working days without pay for policy violations which also include not turning on their body cameras or recorders and allowing an unauthorized passenger, Alisha Stanford, in their unmarked police vehicle. Boykin, Young and Branch initiated appeals of their discipline as being "too severe". Columbus Police Department stated that the investigation into Ricky Ball's death and the conduct of the officers responsible for his death has been handed over to the Mississippi Bureau of Investigation (MBI). With the MBI having a reputation of not indicting police officers, many community members have major concerns about the integrity and thoroughness of this officer-involved shooting investigation of former officer Canyon Boykin killing Ricky Ball, however our District Attorney stated the MBI submitted an investigative report to him of very substantial size. Reportedly, the internal investigation of the Columbus Police department is being conducted by the FBI. The CPD former chief of police, Tony Carleton, neglected the citizens of Columbus by quitting in the infancy of the investigation and the mayor and a majority of the city council members neglected their duties by accepting his resignation. Although city officials could not have stopped Carleton from quitting, they could have all voted to reject his resignation which would have been reflected on his employment background. Ex-Police Chief Tony Carleton originally told the mayor he was going to leave his post to take a teaching job in Alabama, but Carleton is now working for the Oxford, MS police department as a rank and file training officer. In their textbook approach to handle this crisis, city "leaders" and investigators have refused to offer any information that will give the community a better understanding of exactly why Ricky was targeted and killed. The city leaders that actually show concern through their efforts are few in number. Although the promise of transparency was the catch-phrase used by city officials in the beginning, useful information has been hard to come by from them. Our community has no intentions related to violence. However, we are actively engaged in discovering the procedural violations and criminal misconduct of all parties involved in Ricky Ball's death. This includes but is not limited to the police officers on the scene, first responders and crime scene investigators. Our energy is solely focused on receiving the COMPLETE TRUTH and ABSOLUTE JUSTICE for Ricky Ball from our local, state and national civil servants. The MBI completed its investigation into Ricky's murder around June 1, 2016 and handed their findings over to MS District Attorney Scott Colom. District Attorney Colom, per his Office's policy, handed these police-involved shooting death findings over to the Attorney General's Office for the State of Mississippi. Canyon Boykin was indicted for the unnecessary killing of Ricky Ball in a manslaughter charge levied by a Lowndes County grand jury on September 7, 2016 and arraigned for his manslaughter indictment on September 9, 2016 in a vacation session arraignment held in Judge Jim Kitchens chambers, but paid for by public dollars. On November 18, 2016 Circuit Court Judge Lee Coleman granted Canyon Boykin his request to have the venue of his trial changed to another county despite the arguments by our MS Assistant Attorney General that Boykin's case did not meet the standards for change of venue established by the MS Court of Appeals. For more info and to support the Family of Ricky Ball and the Justice for Ricky Ball team, explore our website and revisit often for updates, like and share our Facebook page, follow us on Twitter @jusforrickyball or use the Contact Us link on this page. After Reading the Police Version, Continue Reading the 19 Points of True Facts From the Community and Neighborhood Eyewitnesses. We all know that there are two version of the facts surrounding Ricky Ball's killing. Below is the official police version ​emailed to news stations ​by the resigning police chief, Tony Carleton. The following are facts which are known involving the shooting death of Ricky Ball on October 16th, 2015. Information in this case may seem to be given untimely or slower than you would like. I understand that. As the leader of the Columbus Police Department, I want the information you receive from me to be accurate. I am committed to transparency and want to keep you informed as this case progresses. Many questions you may have can still not be answered until MBI completes their investigation, and I do not want to comment on anything that involves their active investigation. 2) The next radio transmission was a report of shots being fired at their location. 3) The suspect vehicle was occupied by a female driver, Shannon Brewer, and a male passenger who was later identified as Ricky Ball. 4) Three police officers (Canyon Boykin, Johnny Branch, and Yolanda Young) and an unauthorized civilian ride-along passenger, Alisha Stanford, occupied the officer’s vehicle. 5) When the suspect vehicle stopped, the passenger, Ricky Ball, jumped out of the car and attempted to flee. 6) Officers attempted to arrest Ball which resulted in gunfire. Specifics surrounding why Ricky Ball was shot are still being investigated by the MS Bureau of Investigations (MBI). 7) Officers lost sight of Mr. Ball following the shooting. 8) A perimeter was established and the officers called for more back-up. 9) Officers checked several abandoned houses in the area of 15th Avenue North and 20th Street North in attempts to locate Mr. Ball. 10) A K-9 with the Lowndes County Sheriff’s Office was called in to track the suspect and started tracking at approximately 10:23p.m. 11) At approximately 10:30 p.m., Mr. Ball was found between two houses located on 14th Avenue North which is approximately a block and a half away from the vehicle which he was riding in. 12) A handgun and suspected illegal narcotics were found beside where Mr. Ball had collapsed. Forensic Examination, which includes DNA & Fingerprints, will have to be conducted by MBI to determine if Mr. Ball ever possessed any of these items. where he was later pronounced deceased. 14) The handgun recovered beside Mr. Ball was reported stolen on August 5, 2015 in Columbus from a residential burglary of a Columbus Police Officer’s home on 4th Street North. This was the second residential burglary of this Police Officer’s home in less than a year. The first burglary of this officer’s home was reported on Sept. 14, 2014 in which five (5) firearms, two (2) televisions, and an Xbox were stolen. Columbus Investigators are still actively looking for information on the location of Arthur Danagelo Davidson in connection to this burglary. The second burglary was reported on August 5, 2015 at the same residence. In this burglary, two (2) firearms, one (1) television, one (1) laptop computer, one (1) handheld radio, and one (1) Xbox were stolen. The first firearm was the Officer’s Glock .40 service weapon along with his department issued handheld radio. The second firearm was a Taurus 9mm which was recovered within arm’s reach of Ricky Ball when officers discovered him lying on the ground between two homes off 14th Avenue North. 15) All three officers involved in the traffic stop the night of October 16th were equipped with Body Cameras. None were activated prior to or during the shooting. Only one camera recorded events, approximately 30 seconds after the shooting. All of the videos recorded that night by CPD have been turned over to MBI investigators. The community's version of the facts surrounding Ricky Ball's death are very different from the police version. These are just some of the facts known by the community. 1. Ricky Ball was killed for simply running away from his killer(s) and laughing at them previously. 2. Some members of the community believe Ricky Ball and Canyon Boykin have known each other since high school. In the past, Ricky had ran away from Boykin while laughing at Boykin on some other separate occasions before Ricky was killed. Ricky told one of his cousins that Boykin had pointed Ricky out to another officer the week before. Boykin said in front of a crowd "that m-f right there thinks he's above the law, but I'm gonna get him". 3. It is believed that Ricky was under a secret indictment and that this was the real reason for the traffic stop, not a faulty tag-light. Recently, it has come to light that CPD drug officer, Joseph Strevel, told Boykin and his gang to stop the car that Ricky was in because the narcotics agent received information, probably from the driver Shannon Brewer, that made him want Ricky stopped. Boykin and his gang knew Ricky was in the car BEFORE they stopped the car. It is also believed that Shannon Brewer, the driver of the vehicle, is a confidential informant for the Columbus, Mississippi police department. This would mean that Boykin, Young, Branch and others already knew that Ricky and Brewer were coming their way. 4. Resigning police chief, Tony Carleton, said the special operations group (SOG), that these officers were members of, was in the community to "build rapport" with the community. However, they were actually in the community to carry on the fake war on drugs, which is really a political holocaust against "black" and "brown" people to ensure they have no political, economic or social power in this country. Who do you know on Northside that would want to get friendly with two young white guys and a woman known for harassing our young people in the community? 5. Eyewitnesses say when Brewer stopped her car, Ricky only jumped out running and the officers jumped out running behind him while shooting. 6. A ditch along the route Ricky ran showed signs the day after Ricky's murder of someone failing into it. 7. An eyewitness reported seeing someone shooting from near that same ditch on the night of Ricky's murder. Many community members believe this was an embarrassed and enraged Boykin shooting from the ditch, he fired several more shots at Ricky as Ricky ran away. This shooting was done in a heavily populated community with elderly people, families and children all in harms way. One of Boykin's bullets lodged into the back door of an elder lady in the neighborhood. 8. Ricky was hit repeatedly in the shooting and was running through the neighborhood screaming "y'all help me, they gonna kill me!". Eyewitnesses heard and saw this fact. 9. Ricky eventually hid in the neighborhood trying to save his life. 10. Neighbors who heard the shots and Ricky's screams came out of their homes to see what was going on. 11. These same eyewitness neighbors were intimidated by officers on the scene. According to several speakers at a heavily attended city council meeting, these officers intimidated these witnesses with threats of arrest and by pointing guns in the witnesses' faces ordering these witnesses to get back into their homes and and making others get away from the area. 12. At some point the officers discovered Ricky as he was hiding for his life. 13. While Ricky was laying between the homes, eyewitnesses saw one of the officers on the scene drop a gun down beside Ricky while he was laying there bleeding to death. The gun actually belongs to an officer who was on the crime scene that night. 14. Eyewitnesses say both of the ambulances that arrived on the scene sat up by the projects for an extremely long amount of time before one of them was allowed to work on Ricky's fatal wounds. 15. Eyewitnesses say none of the police on the scene attended to Ricky's bullet wounds. They ALL just let him lay there bleeding to death until they allowed the first responders onto the scene. 16. Eyewitnesses say Ricky was alive and moving his head when he was put into the ambulance. The ambulance remained on the scene for a long time with Ricky in the back bleeding to death. Instead of rushing Ricky to the hospital with sirens blasting, the ambulance just sat there too long. When the ambulance did finally head to the hospital, they turned off the interior lights and eased off the scene as if nothing had ever happened, according to eyewitnesses. This conspiracy guaranteed that Ricky would die and never be able to tell authorities what really happened to him. To add insult to injury, the CPD at the hospital did not allow Ricky Ball's family to view his body the next morning under claims that Ricky had no ID on him so they didn't know who he was...even though these same officers had been watching Ricky Ball the night before and had received a call to stop a car because Ricky Ball was in the car. 17. The chief of police, Tony Carleton, "worked" the scene over the phone. The community still has not been told where Carleton was and why he was not at the scene of a fatal shooting by one of his officers. 18. After this community tragedy and at two of the most critical meetings where the community could have gotten some real answers from the police department, the mayor allowed for the chief of police, the assistant chief and the captain of criminal investigations to be out of town and on vacation, all at the same time, in the middle of a possible murder case involving their officers. A fatal shooting and possible homicide by your department would be as good a reason as any to get back to work immediately by plane, train or any means. 19. Canyon Boykin tried to resign but was fired by the city council instead. The other two team members of Boykin were only suspended and may be still lurking in our communities. They should have been fired as well. The chief of police, Tony Carleton, should have been fired also for letting his department be so bad that 3 officers felt it was okay to break their own rules which lead to the death of a citizen and a possible homicide by these same officers with no video evidence! Instead the mayor and a majority vote of the city council allowed Police Chief Carleton to resign for a teaching job that he claimed he had been waiting on in Alabama. The truth is that it is common knowledge around the city that Chief Carleton was actually trying to get the police chief job at Ole Miss before this fatal shooting took place by his outlaw officers. Chief Carleton still has not addressed the people of our community where his officers were shooting-up like it was the wild wild west with no respect for ANYONE living there. Tony Carleton is now working near Ole Miss at the Oxford, MS Police Department. Yolanda Young and Johnny Branch are back on the Columbus police force. Joseph Strevel resigned from the Columbus Police department and is believed to be now working for the local Lowndes County Sheriff's Department.